I’ve not posted much on this (yet), its one of those “hobby” iDoStuff projects, something that’s just happening in my spare time. One one those projects with very little ~(only £20 pound 30$ ish / euro pressure)~ and of course an immeasureable amount of a sportsman’s bet. Is there any better motivation? As of November 2012 its a runner! Ready to face all the officialdom, all the testing (MSVA) paper work (DVLA) so I get it registered, MOT’d and taxed. This has proved a bit of sticking point as I can’t do all this in the odd few hours in an evening. But I’m pushing it now and have made the first step to get a VIN number (required because it’s a new vehicle). This involved visiting the local DVLA office,filling out some forms that wern’t really fit for the job, then getting an appointment for another visit when the inspector was there. A week later I made the second trip this time with the trike in tow, on the reconfigured trailer tent chassis. After a short wait the inspector called me out to have a look. A very sensible chap he was, not worrying about the engine number matching the donner bike v5, not asking to see recipts for all new /reused parts. He took notes on serial numbers he could see, took a few photos had a pleasant chat and told me the new VIN number would be in the post. 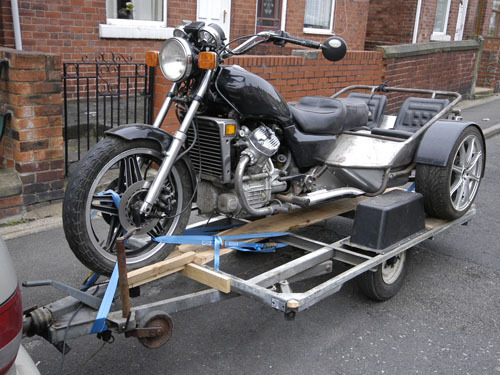 The rest of the write up and details will be on the iDoStuff site, when I’ve got minute, CX500 Trike build pages starts here, but in the mean time: Please leave any questions, comments or suggestions here. Cheers. This entry was posted on Saturday, November 17th, 2012 at 12:33 am	and is filed under I do DIY stuff. You can follow any responses to this entry through the RSS 2.0 feed. You can leave a response, or trackback from your own site. As Promised the New VIN Number arrived in the post. It’s now stamped on the headstock ready for step 2 of the legal stuff THE MSVA..
hi really like the trike , I’ve got an old xj750 that i’m just about to trike so looking for idea’s and found your cx500 like the way you kept it low at the back for the kids and that’s the sort of thing i would like to do with mine ,don’t suppose you got any drawings or plans that you could send me so i could get some idea’s from. Apologies for the late response, I’m up to my eyes in stuff at the moment. It’s on the list, but it’s going to be while yet.